In many cities, bike-share programs have been successful, with large, growing ridership. That hasn’t been the case in San Diego. On top of bad bike infrastructure, San Diego’s program hasn’t implemented best practices that helped programs elsewhere attract riders. Cities have undergone a bike revolution in the last decade, with some seeing years of double-digit growth in annual ridership. One element of the urban biking revolution has been bike-share systems, in which cities contract with private companies to place bike docking stations all over the city to rent bikes for short trips. Users might take a bike from a dock in their neighborhood in the morning and ride it to work downtown, leave the bike at a downtown dock, then ride back home in the afternoon. 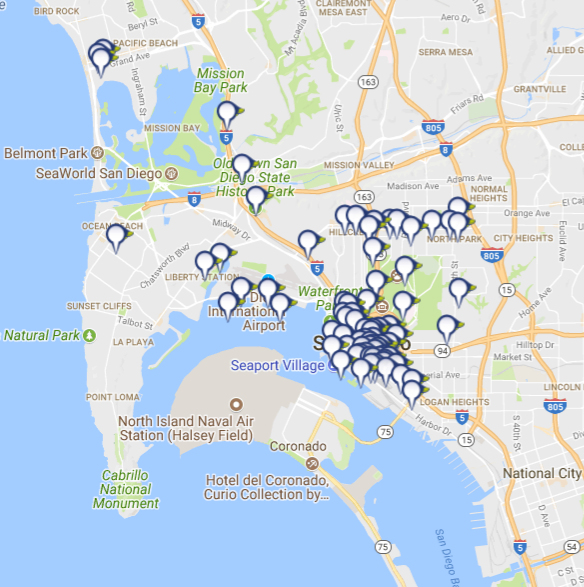 San Diego’s DecoBike system is one of the largest in the country; its 95 docking stations are the 10th most in the country, and its 1,800 bikes could be the fifth most of any American city. Why? In short, the system was not implemented based on the best industry practices, domestically or internationally. DecoBike usage is flagging. In its first year, 2015, ridership was 100,000. In contrast, Minneapolis’ Nice Ride MN got 200,000 rides in its first full year of operations, and had increased to nearly 500,000 in four years – that’s with about the same number of bikes as in San Diego. Philadelphia, with only 1,000 bikes, got 1.2 million riders in its first two years. Plans for expanding DecoBike to 180 stations have stalled; instead, the system is removing stations near the beach in hopes of relying less on tourists. One reason for DecoBike’s low ridership is that San Diego has little infrastructure for cyclists. It is hard to expect people to bike, even when bikes are available, without protected bike lanes. It’s too dangerous, and would-be cyclists recognize that fast-moving cars could kill them in a collision. There is also the risk of being doored by a driver or car passenger exiting a parked car, which is mitigated with protected bike lanes. That’s why bike advocacy groups have demanded protected lanes. “When we actually implement barrier-protected bike lanes, that’s when ridership will increase,” said Andy Hanshaw, executive director of the San Diego Bike Coalition. National groups cite case studies from New York, Washington D.C., Minneapolis and Toronto showing biking rates doubling or tripling after cities installed protected lanes on major streets. Without much existing bike ridership, San Diego is only taking small steps to improve cyclist safety: Its mobility plan adopted last year calls for nine miles of protected bikeways, all downtown. Hanshaw expressed more optimism that by 2019, the city and SANDAG would follow through on plans to build bike lanes downtown as well as in inner neighborhoods such as Hillcrest and North Park. But so far, there have not been any significant improvements to bike safety. All of this is worse in San Diego’s hilly topography: Cycling uphill is physically demanding, while cycling downhill requires fine control to avoid a runaway. Both are less pronounced problems on dedicated bike lanes, protected from car traffic as well as from parked cars, while both are serious impediments when cyclists have to watch for cars. San Diego’s geography is not inherently bad for bikes – and its warm, semiarid climate is a meaningful natural advantage – but the issue is exacerbated by the city’s forcing cyclists to ride next to fast-moving cars. San Diego’s poor bike infrastructure is not the only reason DecoBike is failing. After all, Cleveland has no protected bike infrastructure, either, and yet its UH Bike is stable, with about 50 percent higher ridership per bike in its first year than DecoBike, said Alex Baca, UH Bike’s general manager. Bike share requires a critical density to function properly. New York’s Citi Bike has emphasized this as its reason for not expanding citywide: If it enters a neighborhood, it enters it in force, with many docks, so that there are always some bikes nearby. In 2015, the Regional Plan Association, a New York-based advocacy organization, issued a report with recommendations for expansion. It argued to expand only with a high density of bike docks, and only into contiguous neighborhoods. DecoBike did not do this in San Diego. 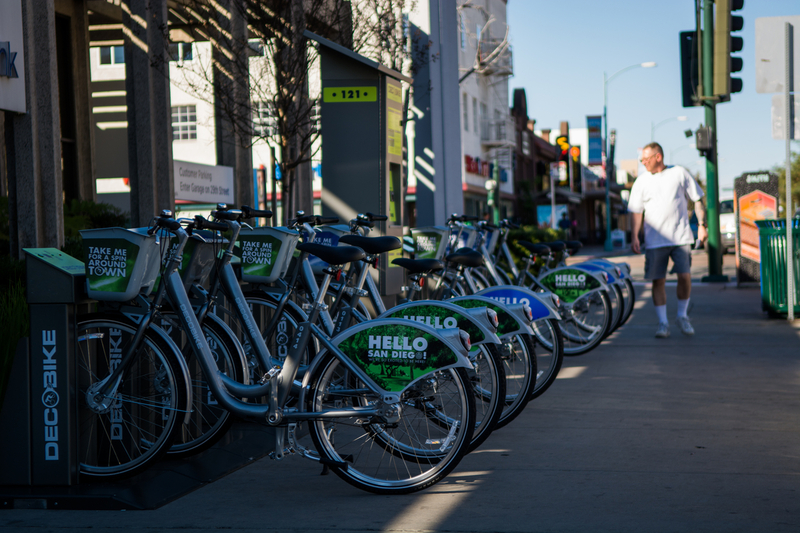 Downtown has a high density of docking stations and bikes. But outside downtown, the stations are scattered haphazardly. There are three in Pacific Beach, all close to one another; people can’t bike from one part of the neighborhood to another. There is one in Ocean Beach. There are a few near Interstate 5, difficult to access from the rest of the system except by car. Outside downtown, the only real concentration of bike docks is near University Avenue, from Hillcrest to North Park. But those still suffer from two big problems. The first is that the density of the stations is still lower than it is downtown, so users may have to walk a few blocks from the dock to their ultimate destinations. The other problem is that the stations are mostly placed along a straight line, missing the El Cajon Boulevard corridor and major destinations away from University, like Scripps Mercy Hospital. Bikes do not need to run in a straight line — if anything, since University has no protected bike lanes, cyclists may well prefer to use quieter side streets. San Diego’s 1,800 bikes would be enough to cover a large fraction of the city effectively. There were plans to install docks along linear corridors, as Voice of San Diego reported in 2014, but the outlying stations have been shelved. Even the original plans focused too much on linear corridors and too little on a growing service area with high density. Philadelphia’s Indego serves a 10-square-mile area around the city center; Nice Ride MN densely serves six square miles in Minneapolis and one in St. Paul, with less dense service on linear corridors going out of downtown Minneapolis. In contrast, DecoBike only has such dense service in about three square miles of downtown San Diego, with thinly placed stations elsewhere in the city. What’s most frustrating is that DecoBike also runs Miami’s bike-share system, called Citi Bike, and Miami’s Citi Bike docks densely cover Miami Beach and downtown Miami and surrounding neighborhoods. In 2013, DecoBike claimed that Miami Beach had the highest bike-share ridership in the United States per bike. And according to data by the National Association of City Transportation Officials, Miami’s Citi Bike has the fourth-highest ridership of any American bike-share system. DecoBike managed to apply best practices in its hometown, but not in San Diego. If San Diego had rolled out its bikes in the same fashion as Philadelphia, Miami or Minneapolis, it would have had many stations not just in its center but also in Balboa Park, Uptown and North Park. It could effectively serve the region bounded by the trolley’s Blue Line, I-15 and the I-8 gorge, with additional service on key corridors reaching Mid-City and Ocean Beach. Riders would be able to use the system for downtown work trips, or for recreational trips to Balboa Park, the museums and some of the beaches. Unfortunately, San Diego does not have that. The city’s lack of attention to bike infrastructure and the bike share system’s poor design have led to weak ridership. It can still salvage the system if it installs protected bike lanes and puts in more docks in downtown-adjacent areas such as Hillcrest, but until it does, it can expect weak ridership to continue.